United Irelander: Fun Irelander Feature - Armageddon! Fun Irelander Feature - Armageddon! A website called 'Save Lives in May' has forecast a giant tsunami hitting Atlantic Coasts...yesterday. 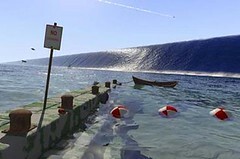 "I have received information psychically, which is corroborated by scientific data, according to which on May 25, 2006 a giant tsunami will occur in the Atlantic Ocean, brought about by the impact of a comet fragment which will provoke the eruption of under-sea volcanoes. Waves up to 200 m high will reach coastlines located above and below the Tropic of Cancer. However, all of the countries bordering the Atlantic will be affected to greater or lesser destructive and deadly levels. This site is dedicated to life, to civic responsibility and to information. There is still time to save lives. Thanks for participating in the world-wide alert!" Hmm. Now my country is pretty close to the Atlantic Ocean and it seems to be still standing as I write this! "Beginning with the moment when you will have finished reading this fourth and last article on May 25 2006, the countdown will be merciless. Every minute lost not warning others will bring about thousands of deaths. Would these not be as many crimes? Are we not dealing here with crimes against humanity? The time might come to pass when we might have to bring suit against those legally at fault." I take it that lawsuit has been put on hold then? "The coming ordeal is that of the entire human fraternity. You will see more fear, selfishness and violence than ever before." Come to think of it my milkman popped by earlier and he did seem more brusque than usual. "All will be clamoring for help, be it psychological, medical or logistical." You can just picture this guy last night praying for a catastrophe, can't you? Granted there was a bit of rain last night but that's it! Rest easy ladies and gents. All is well. Go out for a few pints tonight as well if you want. But if you see a comet fly by, run for the hills! English prepare World Cup victory parade!